A landmark civic building is to open its doors to marrying couples after an £800,000 makeover. 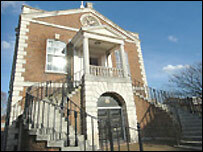 The Guildhall in Poole, Dorset, is to provide a new venue for weddings after standing empty for 16 years. Council conservation officers worked with English Heritage to make sure the restoration kept the original character of the building, built in 1761. The Grade 2-listed building in Market Street now boasts a large ceremony room that can hold up to 120 guests. The public are being invited to an open day at the Guildhall on 14 May to see the venue for themselves. Its first wedding ceremony will be held on 4 May. A spokesman for the Borough of Poole council said the work had safeguarded "one of the gems in Poole's heritage".